Recently, New York museums have presented retrospectives of all three of the most influential artists of Brazil’s postwar avant-garde. Lygia Clark, with her hinged-metal sculptures you can fiddle with at will, filled the top floor of the Museum of Modern Art. Lygia Pape, known for bold, participative performances and sculptures of iridescent gold filaments, appeared at the Met Breuer. And Hélio Oiticica was the man of the hour this summer at the Whitney, live birds and all. The generation that set the stage for them, however — the one that established Modern art in Brazil in the early 1920s — has received less attention here. You’ll have to go back to the Guggenheim’s 2001 blockbuster “Brazil: Body and Soul” for the last big-ticket appearance of Modernist painters like Emiliano di Cavalcanti, Cândido Portinari and, above all, Tarsila do Amaral (1886-1973): the most popular artist of the last century in her home country, but still little known in the United States. Her mature paintings, featuring oversize bodies in flowing, stylized landscapes, provoked the modern Brazilian penchant for antropofagia, or “cannibalism,” that Clark, Oiticica and Pape would all draw from. 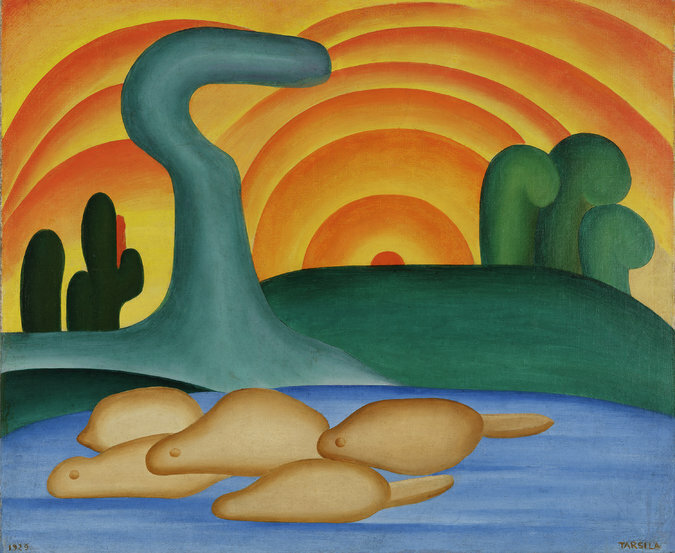 In the art of Tarsila (like a Brazilian soccer star, she is always called by her first name), Brazil found a new cultural confidence that said goodbye to European envy and consumed Western, African and indigenous influences with equal relish.